Looking for Legal Marketing that works? It must not only be visually attractive; it must also be an effective business development tool. That’s why our agency utilizes a full-service approach focused on your messaging. To jump start our creative process, we learn everything we can about your firm – practice areas, how it attracts clients, successful verdicts and settlements, reported cases, attorney bios, and more. With one of our seasoned writers being a former practicing attorney, we have an inside view of how law firms and the legal system works. Once we understand your firm’s culture we get to work designing a strategy for a website that will drive business. The Creative Vision You Want. The Experience You Need. AJ Ross has served as the creative agency for law firms in the New York / New Jersey area for over 26 years. As a result, we have a deep knowledge of the legal marketplace. 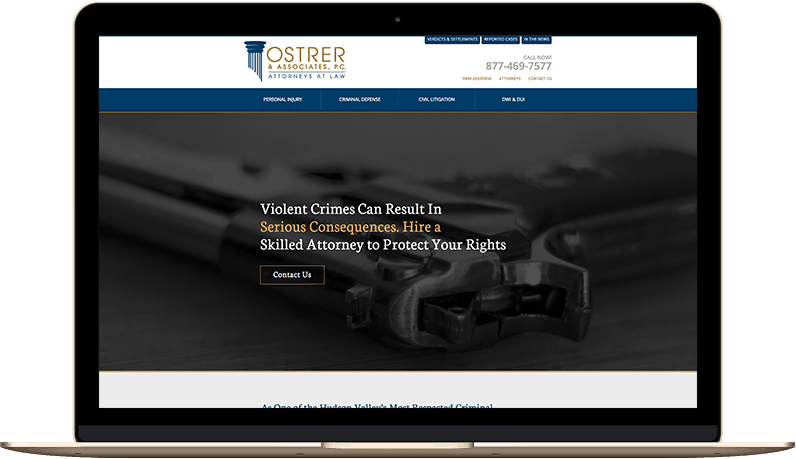 That experience, combined with our artistic vision and development skills, results in modern website designs that showcase the relationship between the concerns weighing on the minds of potential clients and the firm’s expertise in alleviating them. Not Just Another Pretty Site. 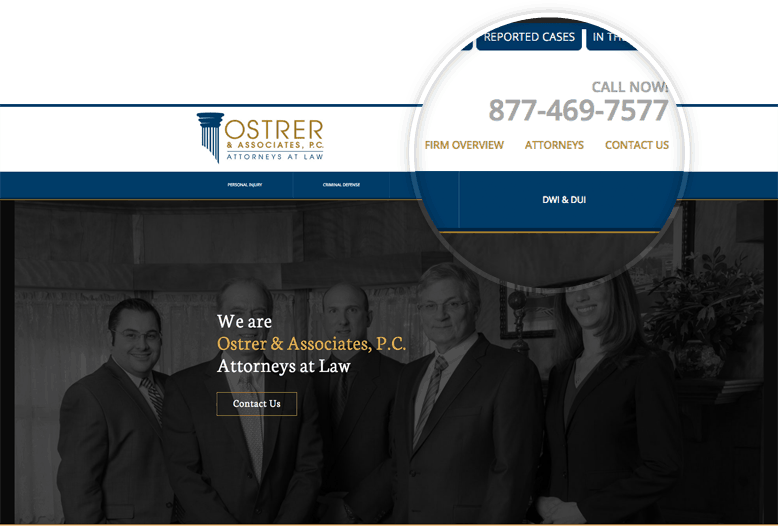 Ostrer & Associates has a reputation for successfully representing its clients. The law firm – which enjoys high ratings on Super Lawyers, Avvo, and Martindale-Hubbell – is often featured in the news and in reported cases. Unfortunately, these achievements and accolades were buried within an outdated website that was cumbersome and difficult to navigate. The firm needed an entirely new design that prominently featured its achievements and capabilities across all practice areas. The firm assists clients in a wide variety of personal injury, criminal defense, and civil litigation matters. Working with the firm’s partners, we identified target client types, then designed an architecture that prominently featured each sub-practice area through streamlined drop-down navigation and internal page linking. For a contemporary look and feel, we incorporated a large, somewhat abstract, header graphic with engaging headlines. This design feature allows practice areas to stand out, while simultaneously respecting the sensitive nature of the subject matter. A large footer call to action balances the design and prominently places contact information. Headshots and bios of partners and associates provide a personal touch, allowing prospective clients to learn more about each attorney’s practice area and accomplishments as well as place a face with a name. Mobile search has now exceeded desktop. And with Google taking note of mobile friendly sites for ranking purposes, we built a site that was responsive from the start. Smart phone users can easily read the content and navigate to all the practice areas, sub-practice areas, firm information and more. As successful outcomes are something prospective clients want to see, we made sure to prominently feature navigation tabs for Verdicts & Settlements, Reported Cases and In The News at the top of every page. 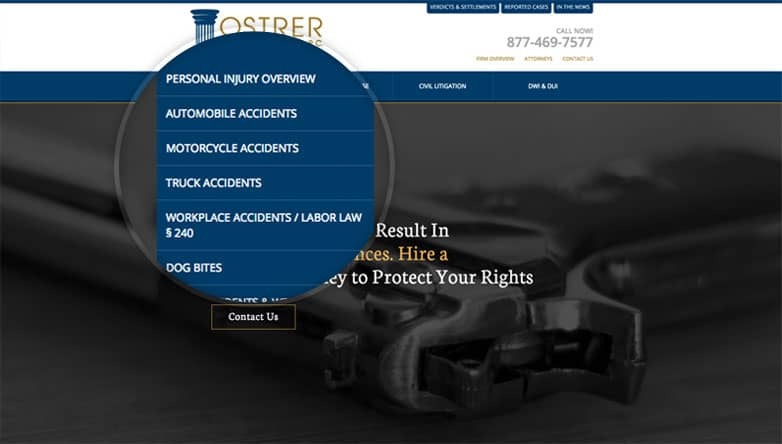 A site search feature on these pages allows users to drill down into the types of cases they are interested in. With constantly evolving technological innovations, we maintain ongoing collaborations with our clients to keep their websites fresh and current. We always have an eye on designing and delivering visionary digital experiences and pushing for better results.